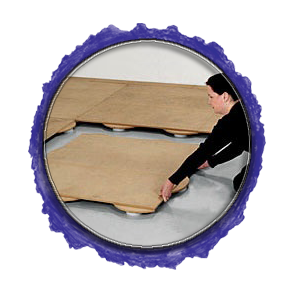 The Rosco Subfloor allows for a floor to be quickly installed over virtually any surface, then just as easily taken up and moved. Yet, it does not sacrifice quality for convenience. Like our permanently installed kiwiFLOOR Studio system, the Rosco Subfloor treats the entire surface of a floor as a single continuous diaphragm. Panels are joined to each other using an extremely clever and patented wavelock panel interface that securely joins panel to panel, reinforcing the panel joints continuously along the panel seams, without hardware. Panels literally slide together.